Get ready for a visual extravaganza, meeting interesting artists and even some art lessons. 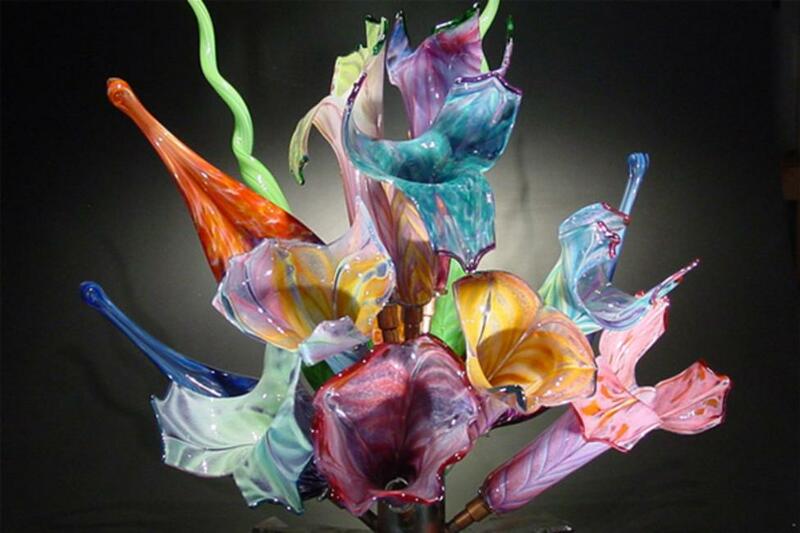 Glass art; molten, intense, brightly colored, blown and stained glass, peacefully coexisting with a multitude of other art forms, ceramics, sculpture, painting, galleries and more. Not only does art thrive in Lehigh Valley, it is a great home base to explore glass and art in the surrounding areas, including Jim Thorpe, Reading, and the Poconos. In between, we’ll squeeze in an art class or two for you to get your hands in the clay, your fingers on the stained glass, and your arms around glass blowing techniques. Beginning your trip in Bethlehem, you can explore the Banana Factory and the Allentown Art Museum of the Lehigh Valley for inspiration, while visiting locations on the Delaware and Lehigh Artisan Trail. On day three, you’ll find your hands in the clay at MudWorks and more inspiration at galleries around Stroudsburg. Day four, it’s off to Reading and the Goggleworks for a private lesson in the glass studio and exploration of this astounding facility with three whole floors of working artist studios. Day five will find you in quaint Jim Thorpe, feeling like you have landed in Switzerland, for more galleries and a lesson in the art of making stained glass. In between, you can enjoy good cuisine and in the evenings, if you have any more energy left, select from a whole collection of musical and theatrical performances in the area. Leave, relaxed and refreshed, after having viewed the whole world through rose colored glasses for a few days. You can “get your art on” as soon as you arrive in Bethlehem today, with a visit to The Banana Factory, Bethlehem’s visual arts center. In addition to offering a variety of art classes for all ages, the center is home to two floors of resident artists, First Friday arts celebrations, ongoing exhibits and Lehigh Valley’s only hot glass studio. From there, you can cross the river into downtown for a gallery walk through historic Bethlehem. Artfully Elegant features jewelry of the finest craftsmanship and quality. The Artsy Diva Boutique hosts handcrafted items by local artists and artisans as well as Fair Trade items and Suzy Toronto art work. Southside Bethlehem offers fine American crafts, jewelry and home accessories. Hand Cut Crystal is home to the finest glass work. After having spent so much time surrounded by Bethlehem’s historic architecture, you may want to take a walking tour of the historic district. Check in with the Visitors Center for an introduction to Bethlehem and information about the walking tours that are available. 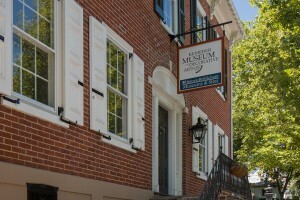 The Kemerer Museum of Decorative Arts, features portraits, landscapes, 19th century furniture, jewels, china, silver and an extensive collection of Pennsylvania German textiles and priceless Bohemian glass. It is one of only 15 museums in the United States devoted to the decorative arts. 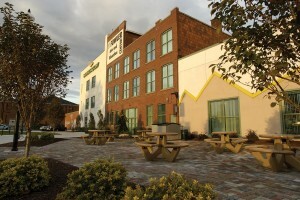 You may also want to visit ArtsQuest™ Center at SteelStacks™ to learn more about this historic city. If there’s time, Lehigh University hosts a gallery and exhibits at the Zoellner Arts Center just up the hill from the Banana Factory. We recommend dinner at Historic Hotel Bethlehem’s 1741 On the Terrace before retiring to you accommodations for the evening. Consider today your arts in Allentown day, where you can explore two museums, and unique arts locations. With a collection of nearly 17,000 works in total, the now more than 100 Old Masters collection began with a donation of 60 paintings to the Allentown Art Museum of the Lehigh Valley which illustrated a balanced spectrum of Renaissance and Baroque art. The early Flemish works painted on wood are particularly beautiful. 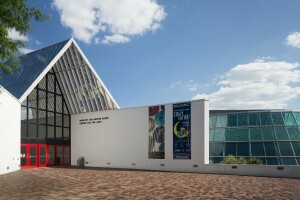 Nearly one half of the museum’s collection of 17,000 works is comprised of textiles from 16 centuries and five continents, assembled to illustrate their role as “the fabric of life.” Changing exhibits over the years have featured Old Masters, Impressionists, and other traditional artists, as well as a controversial exhibit or two. While you are in downtown Allentown, also plan to visit TMD Gallery which showcases artists of Lehigh Valley, including paintings, photography, sculpture, ceramics, jewelry, pottery, wood carving and fabric work. When it’s time for lunch, we recommend Bayleaf in downtown. From there, it’s over to Muhlenberg College and the Martin Art Gallery in the Dorothy and Dexter Baker Center for the Arts, which features ongoing changing exhibits as well as a permanent collection. 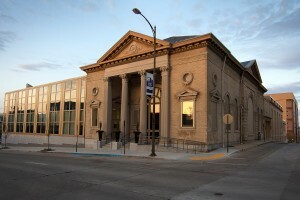 The small college gallery owns, among other works, paintings by Cassatt, Chagall and Salvador Dali, an Albrecht Durer woodcut, a Whistler painting, a Rembrandt and a Mies Van Der Rohe chair. If there’s time, you can set out into Lehigh Valley&apos;s countryside to sip at some locations on the Lehigh Valley Wine Trail. We recommend dinner at Alburtis Tavern this evening. OK, enough inspiration, it’s time to start creating! Even if you’ve never had any art classes, the artists in Lehigh Valley will get you into the swing of making things. This morning, at Mud Works in Stroudsburg, you can make your own hand-built, stoneware mug that will have tongues wagging when you take it to work for your daily cup of Joe. Just for good measure, your one-of-a-kind original work of art will be food, microwave and dishwasher safe. With mug in hand, you can move on to the Stroudsmoor Country Inn for lunch and a private tour of the Gallery at Auradell, located on the grounds. From there, it will be just a short jaunt to visit Andrei Protsouk Art and Design Publishing, where you can observe his dramatic paintings in progress. Every month, in addition to offering his own work and a variety of limited edition prints, he exhibits other Russian artists including Gorbachev and Grigoriev. The ARTSPACE Gallery in Stroudsburg is a cooperative fine arts gallery of contemporary artists living in the Poconos. Exhibits are the work of juried members which are rotated every month. The Hughes Library displays works from its varied permanent collection as well as continuous works from artists of the Poconos Arts Council. 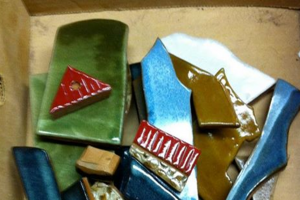 Be sure to wrap up your exploration of the arts in Stroudsburg with a visit to the Linda Schwartz ceramics studio which produces hand built stoneware and sculptural stoneware pieces. 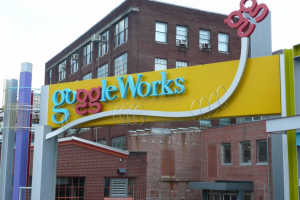 This morning after breakfast, you’ll be off to Reading and the GoggleWorks Center for the Arts. This former factory is filled with three floors hosting 34 artist studios exhibiting every kind of art imaginable, galleries, and studios, workshops, and classrooms. There is art everywhere you turn. Good quality art, interesting art. As an added bonus, the studio spaces are filled with real, live working artists, who are very engaging to talk with. You can spend an hour, a couple of hours or most of the day working your way through. At an appointed hour during the day, you will be treated to your own private lesson at Goggleworks to experience the magic of hot solid glass sculpting in a hands-on workshop where you’ll pick and apply colors, twist and turn your own piece and then blow and shape it into a colorful and unique paperweight or glass flower. Not to worry, no previous experience is necessary! When you need lunch between all the visuals, you can grab a bite to eat at the little ethnic café downstairs. Head back to Lehigh Valley with your creation in hand and head buzzing from all the works you experienced. We recommend dinner this evening at Gio Italian Grill. 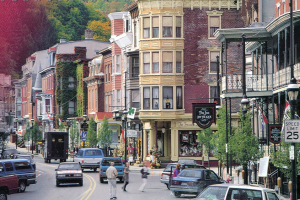 The charming little mountain town of Jim Thorpe where you can enjoy a historic walking tour is home to eight National Historic Landmarks, 20 art galleries and incredibly quaint streets lined with Victorian buildings. The original headquarters of the Lehigh Navigation and Coal Company sits prominently in the middle of town. The town grew as the transfer and transportation hub for coal being shipped down river on the Lehigh Canal. The Old Carbon County Jail held the Molly Maguires, the Irish miners organization who fought for better working conditions, while they were awaiting trial. Galleries in Jim Thorpe include the Anita Shapolsky Art Foundation located in an 1849 church with stained glass windows which features abstract art from the 50s, the Dakota Ridge Gallery, with fine art photographs from artists throughout the world, Rosemary Rememberances II and Black Diamond Gallery featuring lithography. When it’s time for lunch, enjoy it at one of the many places in downtown Jim Thorpe. This afternoon, you’ll be off to a three-hour introductory stained glass lesson with Hill Home Forge to take home your own stained glass creation. On the way back to Lehigh Valley, we recommend dinner at Cia Mia Italian Restaurant. As you leave the region, it’s off to browse through two massive antique locations, part history, part shopping. 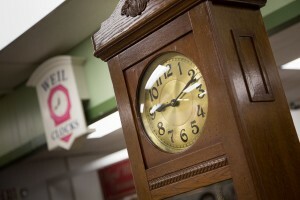 The Weil Antique Center, located in a large converted warehouse features over 150 dealers displaying quality antiques ranging from furniture, clocks, china, vintage clothing and more. Merchants Square Mall is housed in a facility that produced military aircraft during World War II, originally built to produce the Sea Wolf for the US Navy. If you are so inclined as you leave for home, you can stop at Clover Hill Winery & Vineyard, producing unique Pennsylvania wines and Pinnacle Ridge Winery in Kutztown, a small family owned winery that produces some of the most awarded wines in the region. A bit further south, you can view the remaining locations on the Lehigh County Log Cabin Trail near Coopersburg and Zionsville. For art lovers, there’s no better trip than days filled with viewing and creating.